How a lab at Queen's University is using Linux to develop programs and control hardware experiments. Linux is readily establishing itself in the biomedical field as a powerful and reliable system for research computing. Mr. Komarov tells us how he used Linux to give an old database new capabilities and thereby saved his government money. Presented here is an overview of the kind of remote sensing that is done at Southampton University and how Linux has helped improve our productivity. Linux is a good business product. 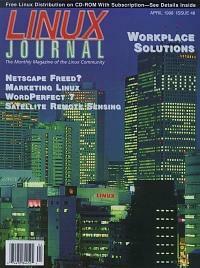 This article deals with the why, how and who of selling Linux. Here's an explanation of how Imake works and how you can use it to build your executables—an article for programmers with C and Unix programming skills. This month we are presented with an introduction to the networking of distributed objects and the use of CORBA. Mr. Shapiro shows us how to write a program to compute internal rate of return using three programming languages supported by Linux—Perl, C and Java. Netscape source is now free, who would have thought it? Eric Raymond, that's who. Here are his insights into this momentous event. This month Mr. Lerner shows us how to set up a web site using many of the techniques he's taught us over the past months. Managing your Logs with Chklogs An introduction to a program written by Mr. Grimaldo to manage system logs. The main goal of this article is to learn what a driver is, how to implement a driver for Linux and how to integrate it into the operating system. An article for the experienced C programmer.